It can be quite a hellish experience when it comes to elder care. Not in an uncaring way for sure, but more likely in a most responsible context. Who doesn’t want to take care of aging family members? I believe that most of us would love to do the task. But, we cannot deny the fact that some of us just don’t have the capacity to do it. The responsibility to take care of aging family members is often delegated to nursing homes; which often be a draining decision. Puzzle out the concern, granny pods offer a compromising solution. 1. What is A Granny Pod? A granny pod is basically a cottage for elders. The tiny home-like structures are adjacent to your main house and serve a purpose to housing elders. The pods are usually way smaller than the main houses and fit for one to two persons. The structure usually consists of a kitchenette, a bathroom, and a bedroom that often aids as a humble living room too. Not only do the pods have a different number of rooms and floor plans, but they also are different, in terms of its mobility and continuation. Some types of the granny pods are actually transportable; making it easy to be shipped in case you sell or move to a new property. Because the pods are meant for elders and somehow assist you in taking care of them, the pods are usually equipped with monitoring systems and other advanced technologies. The technology and system can be those that are obliged to medical supports, safety and security assurances, and also entertainment instruments. 2. Why Should We Go for It? As much as we want to keep our parents or other senior family members close, there are also some issues that make it a foul to have them sharing the same roof. It is selfish to persist them in staying; in a sense that they do want and definitely deserve an independent life. Some elders might be in need of certain medical support or anything, but unless they do, you shouldn’t make them uncomfortable by asking them to stay together with you along with your partner, kids, and maybe your enthusiastic pets too. Yes, sometimes all they need is solitude. They, indeed, also need a sense of ownership. And, most importantly, they wish to get those two without being an arm-length with you. Granny pods are a good alternative to nursing home facilities. Worry no more of not being able to see your favorite elders every day because these pods can be built right into your backyard. The pods resemble both exteriors and interiors of regular homes. Hence deciding how it looks from the outside and inside totally depend on the one who lives in it. Still, even though it is elders’ personality and lifestyle that define the pods’ designs, there are some general features, namely wide doorways that support easy access of either walking or wheelchair passing, even flooring, and open floor plans. Some pods are also equipped with health monitoring, ‘Smart’ home features, ADL assistance, and pressurized ventilation to support the elders. In the United States, a granny pod’s cost ranges between $85,000 to $125,000. You can build or purchase units that suit to how much money you have without re-spend the same amount of money as the nursery homes services. Besides, compared to nursing homes, the prices are relatively cheaper. Average nursing homes in States charge $93,000 per year which make granny pods earthables wise value. Since some pods are moveable, you can actually seek for possible pre-used pods. Talking about the affordable unit or even possible for sale items that are even cheaper. Or, if you consider a less permanent option, you could also find a granny pod’s rental that usually cost around $2,000. Even though the granny pods floor plans are usually similar, you can still pick your own design for the interior and the overall theme. Here are some adorable picks to copy on your backyard. Show your love to your favorite elders by designing a glass house-like pod for a modern yet classy effect. Allow the elders to do gardening and beautify their small greenhouse with colorful flowers and plantations. Make the pod a little sanctuary not only for the elders but also for their grandchildren by opting for a traditional-hobbit-style like a hut. Channeling the Victorian style by designing a unit with a dome roof and green grass field around it. 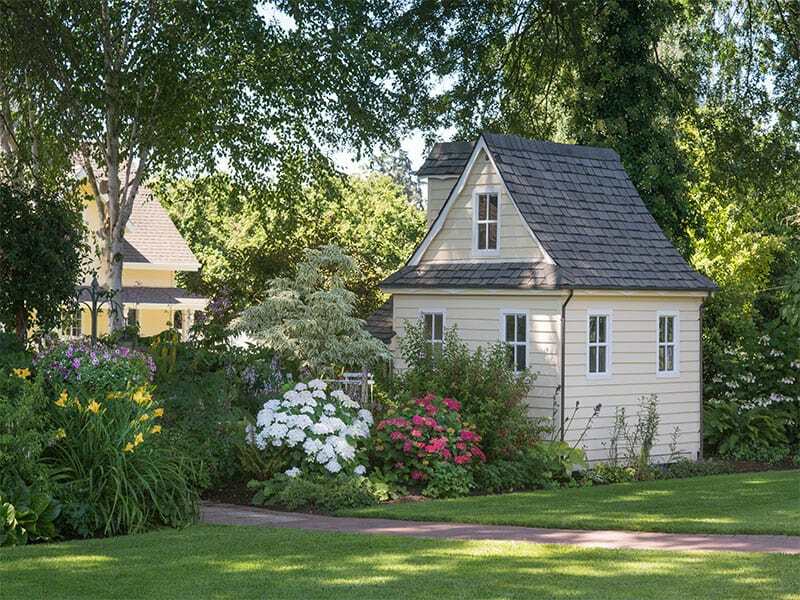 Connect the main house and the pod by having a nice garden pathway; one pick that is surely pretty for larger and spacious backyard. Bring back their memory by having a classic vintage house vibe. Play around with granny pods interior by opting for shabby vintage furniture, wallpaper, and else for a little throwback treat for the elders. Granny pods could be a great solution for elders housing. Hopefully, you find inspiration from these granny pods designs, thus able to provide elders an independent, convenient life without scarifying distance.